It appears that getting offended has become the regular pastime of many people in today’s world. People are offended by any and everything. In May 2018, a white US teenager posted pictures taken on prom night in which she was seen wearing a traditional Chinese dress. This made many social media users angry. They accused her of “cultural appropriation”! In June 2018, a Nigerian (the CEO of Ovation International Magazine), Dele Momodu, shared online a picture of himself and a vendor he described as his friend for 20 years and many people attacked him on social media for not changing the man’s status. In their view, if you are rich and your friend is poor, it’s your responsibility to make him rich. If you’re educated and your friend is not, it’s your duty to ensure he becomes educated too! None of these people expressing outrage saw the illogicality of their contentions. But Momodu addressed this in his responses to some of the comments on his post as shown in the link above. I did too in a post on my Facebook page, Aunty Edith, published about the same time. It appears that there is no way to avoid getting people offended nowadays. If you’re happy and living well, they claim it means you are insensitive to those who are suffering; if you’re gloomy, they say you’re unthankful because many don’t have your blessings. 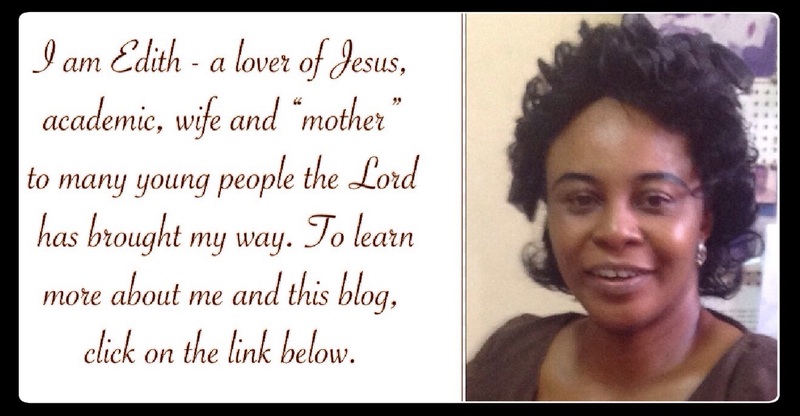 My aim in this post is to address you and I who are Christians, saved and living as ambassadors of Christ. We are not called to be that grouchy person, who’s forever picking faults and throwing stones at others. It may seem like the norm now: to rain on other people’s parades, to accuse them of every conceivable evil, but that shouldn’t be our preoccupation. So, how can we live in this digital age (in which the world has become a global village and people’s lives are so interconnected) without getting constantly offended? Do not think the worst of others. If you learn that a celebrity dressed gaily to what was supposed to be a sombre occasion, don’t make a mountain out of the faux pas and insist that they meant to disrespect the matter behind the occasion and all those who care about it. Such things can occur when someone has a busy schedule and his or her handlers make an oversight. They may have come from a more cheerful occasion which their stylist dressed them appropriately for and may have squeezed in the latter occasion without adequate information or time for a change of wardrobe. This applies to other mouth-froth-inducing areas in today’s hate-filled climate like religion and politics. All of us can’t be of the same religious and political persuasion but that does not make everyone who differs from us a moron or a monster. In every religious and political camp, there are crackpots but there are also heroes who go above and beyond to do the right thing. But for the most part, there are regular Joes on all sides who sincerely want to see society get better and do their bit everyday to see that happen whether by being charitable to the next person or by paying their taxes and obeying the law. No one on this planet is perfect and none will think exactly like we do, so we just have to tolerate one another and acknowledge the good in others ’cause it is there if only we look. The problem today is that some of the most insistent advocates of tolerance are actually the most intolerant. Mainstream Western media have become notorious in this respect. Tolerance in their view means agreeing with them. They are pushing for uniformity of views and creating an atmosphere where people are afraid to honestly speak their minds for fear of being called hateful and bigoted. For example, if you do not endorse the LGBTQ lifestyle; do not denounce US president, Donald Trump, at every turn; believe in the Bible and prayer, you are hounded and scorned in much of the media. It makes no sense to demonise everyone in a different religious and political camp. Is variety no longer the spice of life? I’d rather open my eyes and learn valuable lessons from the virtues of others. Does that mean we condone what we feel is wrong? No, as long as we realise that we’re talking about these wrongs in the lives of people made in the image of God and go easy on the dismissive and contemptuous tone. Crassitude does not become a believer! 2.Set your priorities right: What are you passionate about? What are the things that make you lose sleep at night? Are there particular and significant things that make you lose your cool or is every petty thing your concern? Jesus got angry at those who turned the temple into a market. He upbraided the Pharisees and teachers of the law who preached one thing but did something else and made service to God burdensome through their hard-hearted interpretation of Scripture. These are issues worth a reprimand. Get close to God and He will burden your heart with matters of eternal value so that you don’t join the company of those who waste their time finding out how celebrities spend their every penny or some such triviality and bitching about it. Political correctness is not a heavenly agenda. It’s a media and culture thing. While some of the issues involved like racism and sexism need to be dealt with, the interpretations they are given are often ridiculous. People now walk on eggshells and even jokes that can only be seen as insensitive by a long stretch are quickly labelled racist or sexist and the sources pummeled from all quarters. Remember the case of the teens from Covington Catholic High School in Kentucky who were vilified and threatened along with their families and school for “harassing” an old Native American man who claimed to be “a Vietnam war veteran”; the hate crime Empire actor, Jussie Smollet, reported was committed against him and the purported Russian government collusion in the 2016 US presidential elections. The credibility of the US mainstream media is in tatters. They go from hoax to hoax, giving credence to Trump’s allegation that they are awash with fake news. 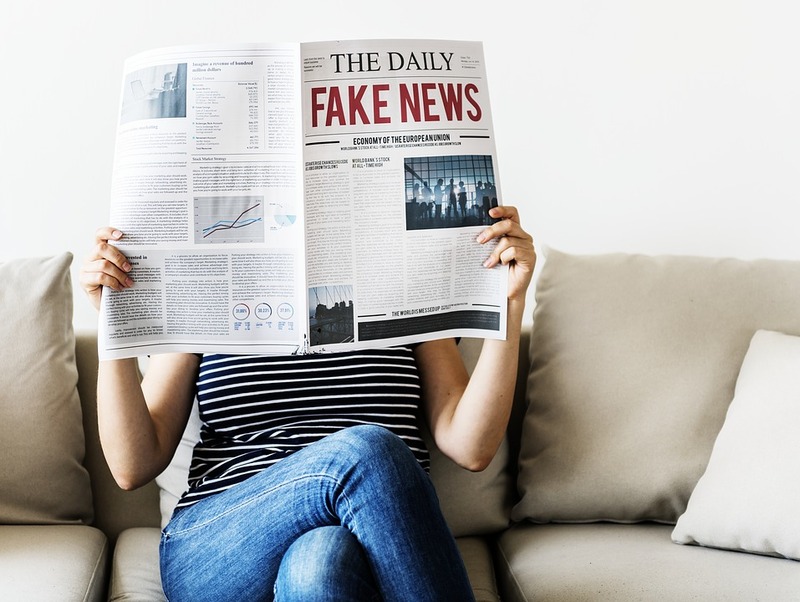 The situation in Nigeria where news reporting is often reduced to the peddling of sometimes unfounded accusations between politicians and celebrities isn’t much better. 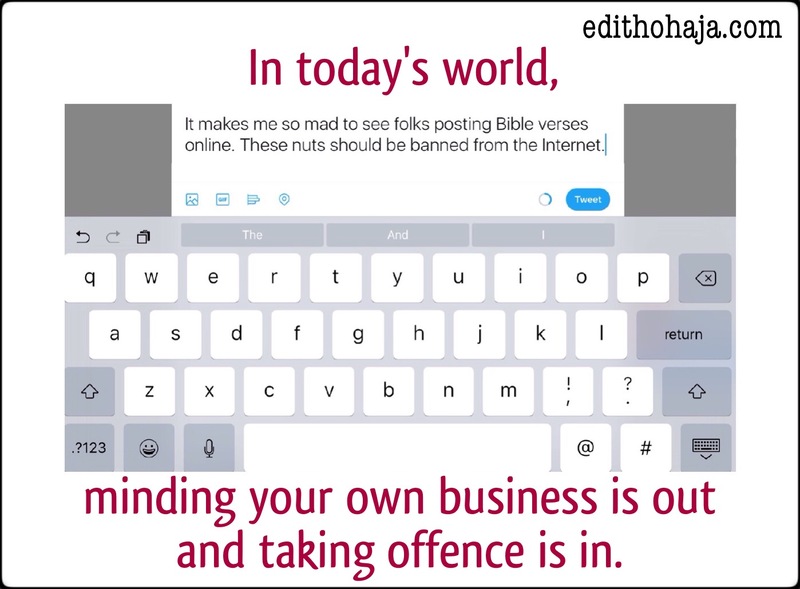 Ethical violations abound in the Nigerian media, especially the online segment. So think about it: Do you really want to spend your time, energy and resources ranting and acting on matters that are hyped by discredited media, matters that may eventually turn out to be non-issues? No, I think you can do better than that. 3. Steep yourself in the word of God: The word of God teaches us about grace and meekness, two sure cures for the easily offended. It teaches us about Moses, Jesus and others, who had divinely-ordained ministries but were constantly opposed and harangued by those who thought they knew better what and how they should be engaged. They bore the harassments and responded with grace except when the offenders crossed a dangerous threshold as in the case of Korah, Dathan and Abiram in the book of Numbers, chapters 16. Note that they sparked a rebellion and spurned Moses’ efforts at conciliation. The prophet Isaiah said the following of Jesus, the Messiah, and we don’t reflect His nature when we constantly rail against others. 4. Get over yourself: Is it really your place to be the fashion, language and etiquette police for everyone else? What makes you think your views matter so much or that they are superior to those of others? I’m talking about your idiosyncracies and culture, not Scriptural commands. Most times, it is more beneficial to observe and learn rather than getting involved in everything and rushing to judgment. And we are called to love, not to sit in judgment and make matters worse for those concerned. There are occasions when a video of some seconds surfaces online and people condemn those seen it and call for mass action against them like the boycotting of their businesses without waiting to hear the whole story and know the context of what they saw. They serve as jury and judge and begin to execute punishment on seconds of footage which its interpretation often dramatically changes when a longer video of the event appears as in the Covington school boys’ matter referred to earlier. Or they hear one side of a story and call for heads to roll. Remembering that we make mistakes too, that we offend others and err in many ways should deliver us from such rashness and superciliousness. 5. 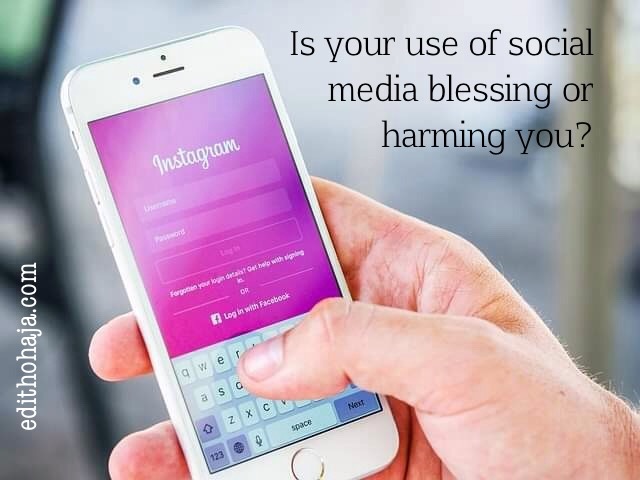 Spend little time on social media: The social media have become the haunts of millions who seem to have time on their hands and seek to inflict as much pain as possible on others. Some have suggested that these people don’t feel very good about themselves and that, in a morbid way, making others hurt or cry gives them some satisfaction. From time to time, celebrities, who have huge followings, decide to take down some of their social media accounts due to the unbelievably cruel comments and messages they receive which manage to outweigh the goodwill coming in, especially at trying times. No one needs that level of negativity thrown at them frequently. And when we spend an inordinate amount of time on social media, we suffer the same oppression the receivers of these highly toxic messages do. Brutalisation engenders a hardening process. In time, we would likely be desensitised to the harmful messages to the point that we not only see them as normal, we begin to dish them out as well. If you still flinch at the callousness displayed on social media, thank God. And to keep it that way, stay on social media only as long as you need to stay connected and current. Don’t dive into every fray therein, don’t soak in the poison lest you begin to spew it out before long. Some people irked by the unrelenting pricks from the ever-offended often tell them to get a life. Those addressed usually consider this an insult but I beg to differ. It is very good advice. Each of us should get a life outside the media, a real life, that helps us to put things in proper perspective. And the best life is that lived in God through Christ Jesus. Everything changes when the Lord Jesus takes over the saddle of your life. You will understand what the Bible means by we are in the world but we are not of the world (Philippians 3:20) and the love of God which is shed abroad in our hearts by the Holy Ghost (Romans 5:5) covers a multitude of sins or offences, if you like (1 Peter 4:8). Almighty God, I repent of my sins and ask You to forgive me. I receive the work Jesus did for me by shedding His blood for my sins. Write my name in the Lamb’s Book of Life and send Your Spirit to live in my heart and teach me Your word. I receive the grace to live a life that honours You henceforth in Jesus’ name. Amen. Now you are born again. Join a Bible-believing group of Christians to help you learn, through studying the word of God and prayer, how to practise your faith and live victoriously in Christ. You are blessed in Jesus’ name. The scriptures in this post are from the King James Version of the Holy Bible except where otherwise stated. From reading this writeup, I can conclude that to live with joy is a decision. The 5 points listed are necessary to attain peace and joy. I think no_1 triggers the main message: tolerance is the mother of all the points. I understand that at times we are the cause of some unrest happening around us.. Investing too much of our time in negative activities, mostly criticising fellow individuals. Moreover no_3 is a point not to be left out: the word of God is full of wisdom, and to me I see the word as love which we should embrace with a heart free from hate. May God help us..
God bless you richly in Jesus' name. The point that we always see something wrong with what someone else does or what that person didn't do is because we do not have that life of God in us .I know that the life of God in us brings out in us love for our fellow human beings. We should also learn to keep off from social media hate speech because it does not reflect the life of God. I have a Question, what should we do about what we see in news stories? It depends on what it is. Some stories require nothing from us, some require prayer, comment or action. But before we blame anyone or say and do anything negative about them, we must verify the story over and over and still tread with caution. 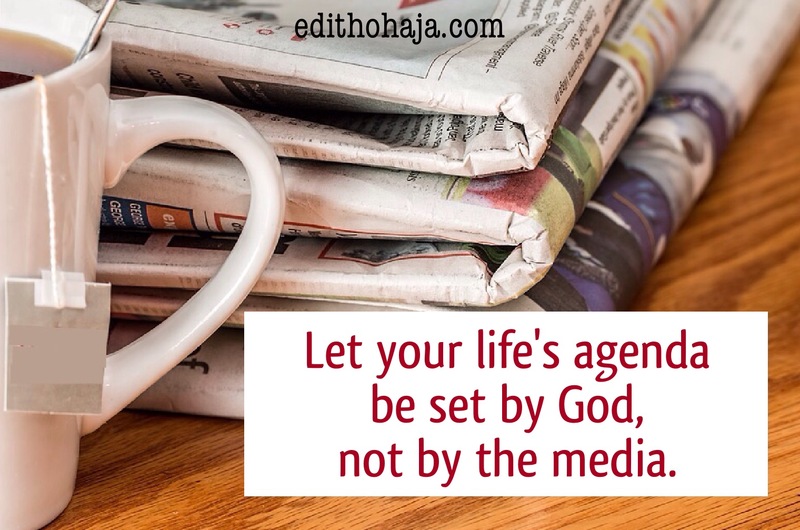 Always put yourself in the shoes of the person at the receiving end and get God's go-ahead if you want to do something serious about any story. I hope this helps. Have a great day, Ifunanya! Be super blessed, Rachel, in Jesus' name. Personally, I figured the way to not get angry about everything I hear or see is to ignore it. I have learnt not to react to everything because not everything requires my energy, some things are just time wasters. Social media can be quite deceiving, intimidating and still educative, so I have learnt to allocate my energy to the educative stuff and stay away from the drama. Good approach! God's grace all the way, Chinonye! Edith, you are so right! People think that they have the right to never be offended by anything...ever! And I have to admit that I have, at times, expressed offense or indignation over things that were small and petty. The truth is that we’re all guilty. One thing that has helped me tremendously lately is the acronym T.H.I.N.K. It stands for True, Helpful, Inspiring, Necessary, Kind. If I can honestly answer that what I’m about to say (or type) meets these criteria, then I go ahead. But if not, it’s better to keep my mouth shut (or my fingers still). Love the T.H.I.N.K criteria you talked about, Erin. Following it will certainly keep us gracious. May the Lord help us to represent Him as we should wherever we find ourselves in Jesus' name. All these points are really sure ways to avoid being easily upset but the one that caught my heart was the third one, which is steeping in the word of God. The Bible said that God is love, to seek the word of God is to seek God, to seek God is to seek love which overcomes all. With love anger is kept at far distance. True, Emmanuel! May we forever live in God's love in Jesus' name. "All of us can’t be of the same religious and political persuasion but that does not make everyone who differs from us a moron or a monster" . This is really very important, because nowadays people tend to judge others with the way they appear, worship and do other stuffs, that shouldn't be so.because he or she doesn't dress and behave the way you do doesn't give you the reason to write them off!. Thank you, Ma, for these wonderful reasons why we should not get easily offended. You are sooo blessed, Daniel! Most importantly, steep yourself in the word of God. Christ's presence fills every hollow point. We are dead to everything and Christ lives so it shouldn't be a threat to us, nothing at all should be a threat. Have a pleasant evening, Kosisor! I believe that one reason why some people get so readily offended is that that they don't stop to think about why they're really getting angry. Some of the issues they pick offence on don't even concern them in the first place!! They just like the sound of their own thoughts being voiced out, or, in the case of social media, being written down. Another reason is an unfortunate lack of open mindedness to accept that everyone simply can't have the same views and outlook as them, hence the judgement. There's nothing wrong with having strong personal opinions, but we should also learn to tolerate those who don't agree with us. I pray that God gives his children the grace to leave all judgement to Him and also the grace to tolerate our fellow human beings. Leaving all judgment to God? Read carefully the related post on "Jedge Not ..." that I added for a bit of context on thos or check out my blog post: "Myself, the Judge!" You sre lifted in Jesus' name. I think this boils down to what is said about not being able to please everybody. Man becomes lost and a non entity when he embarks on that journey to please others. For me, it is always cool as long as my conscience is clear and I know I have my validation from God. Life is easier that way. I like what you said about getting our validation from God. Happy weekend! I have learnt not to get myself involved in these things because i know what i can say or react to and most times people post things to get others upset. The best thing we should do is stay away posts that can trigger offence. "Don't allow the media to whip you over a frenzy over anything" that settles everything. We should set our priorities right and learn to mind our business. Not every question deserves an answer. In all, Let Love Lead. Bless you ma. I believe people get easily offended because they are frustrated with life and so will transfer their anger to others in order to feel good with themselves. This is however a wrong thing to do. I believe with the steps used in the post people will begin to tolerate one another. Nice writeup ma. This message came the point I needed it in my life. Thank you soooo much Mummy. You remain a blessing every time. I agree with you ma'am, whatever story one hears online, we should remember that there are always two sides to every coin and we should also learn to mind the way we react to whatever we see or hear, who knows, it could come back to get at you. Hmm. In an age where everyone wants to be a Savage on social media, be the trending account, without cognizance of the others' feelings, Netiquette is advised. For me, I have this understanding that if I am angered by people, I have traded my peace for nothing. I overlook and smile at whatever is thrown at me; no one is worth my anger I say. *Most times, it is more beneficial to observe and learn rather than getting involved in everything and rushing to judgment"- I love this Aunty. However, as you rightly said, we can't do it on our own without the Holy Spirit. Thank you. This is really a mind opener, MA. For those who don't "have a life" outside the social media. It points out the signs and some consequences of their actions on social media especially for those that are not passive. And it also serves as a precaution for those about to fall into the habit of living only on social media. Well done, ma! Honestly social media is one thing dat is trying to destroy the life of many. i am also an addict of social media but after reading this lovely message i think i have to reduce the time i spend on social media and give most of my time to God because social media is not adding much good to my life. Thank you, ma!! Very nice write-up ma, I think the world has to see this, cos in our present society the rate of discrimination, and bad mouthing people is now much. No one is left behind, celebrities, politicians, and even individual persons. I was in bus going to enugu one faithful day, and it happened that an Hausa man kept his bag at the seat at my front, and then one igbo guy came and was like who dropped this stuff, when he was told it was an Hausa man,he was like " is that a human being" and threw the guy's bag away... I'm igbo but I really felt for the Hausa man, like things shouldn't be done this way, we are brothers irrespective of our religious or cultural differences . Well said Ma'am. A word is enough for the wise. What you said is clearly what's happening on social media and other platforms for self -expression. May God give us grace to learn and practice caution in correcting others. Some people get offended easily as a result of frustration to the extent that they are always prone to finding faults in what others do and in what they have failed to do, In such a situation this write up has recommended that we "steep ourselves in the word of God", that once we are rooted in God he will fill us with his grace and meekness towards one another and as well ignite that fire of love in us . We should always try to tolerate and accommodate others and not frequently pointing out their weaknesses because some people find it difficult to see anything good in their fellow human beings. Well done Ma . People get angry easily for the fact that they want you to think and behave the way they do But that's impossible, we are all different, sometimes people go extra mile to take paracetamol for another persons headache in the name of" Savage "some say sh*t about people because others condemed them just to follow trend. Tnk u Ma I trust social media... who know go know simple! So inspiring ma! Indeed the best way to avoid being angry is steeping to the word of God. Because the word of God contains soft and fluffy words that can calm down any burning rage at a sight. So I urge us(believers) to always acquaint ourselves with the word to get eternal rest for our mind and soul. Ma, more grace for more wonderful piece. The first point really got my attention because I am a believer of giving everyone the benefit of a doubt. Don't just judge someone based on their reaction at one time or the other. You might have met the person at the wrong time and their attitude would have been different in another circumstance. "Set your priorities right" this was actually directed to me and I think have taken my correction. Nice write up Ma. so true Edith, it happens all the time..you brought out the right focus wonderfully..hit at the point..I love what you said, the real life is outside..in Christ..so many are wrapped up in social media and the world of the social stars..and they think that is the real life..it is not.powerful powerful! 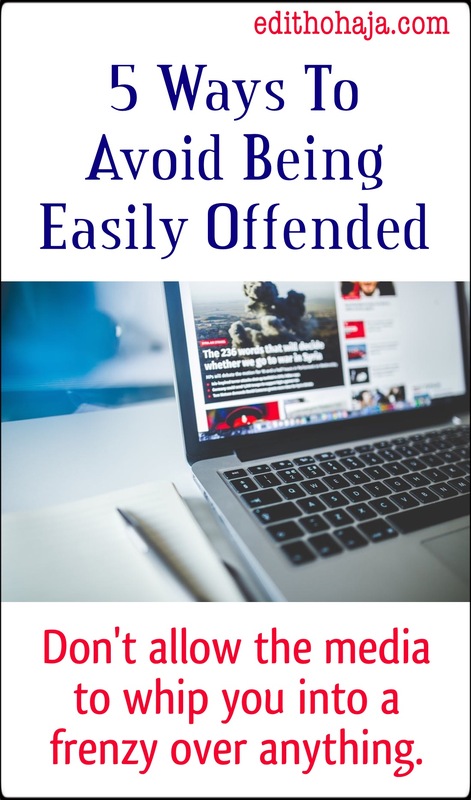 Most people suffer from getting offended easily, well done ma for this write up, it basically teaches people to avoid being easily offended. we should put this to practice and always involve God in our daily activities. Setting our priorities right is definitely, a good point. Well done ma. This post is very educating. One of the most difficult things to do in this life is to please everyone.. We all should bear in mind that we can't please everyone. We should just do our best and leave the rest to God. Heavens! this is just the right message for this generation.and a name has been given to it called 'savagery' people talking without caring about the feelings of others, understanding and respecting the differences in others have been traded for wanting you to be what they want, and everyday, our youths most especially, are swimming in this ocean of insensitivity and funny enough, its getting worst each passing day. i pray God fills that void, or whatever it is that makes us so sad, so we can see the happy part of life. most times, when people do or say things in such a way as to get me angry or offended, I try to avert the anger by also offending them too, that way, they will end up being angry while I smile within. that has been my weapon for a very long time now, but I hope to put the guidelines in this post into practice from now. thank you ma for this, I have been blessed by it. Getting over yourself and admitting others opinions give you better chances of learning new things. Also, tolerance is highly needed in our society especially now social Media tend to form what we think and do. Social media has got most people breaching common morals too. It's not our place to judge or try to force our ideas on others but it would be a big omission to not learn important lessons from the realities on the media. Focus on your priorities and use the media in the favor of them. Your writings Madam are large mines of knowledge. Proofreading is very important. Cheers! Socal media has made a lot of people forget that there is a reality, if we keep taking to heart what people think about us or there judgemental statements towards we will miss the bus. Only positive things should have effect on us, no room for negativity! Thank u ma for this guardlines . At least with this guard lines people won't get easily offended if applied . Ma, sometimes getting angry can not be helped. In our society today, everyone post about their lives and activities on various social media platforms without thinking twice about the repercussions. Like there is no privacy at all. When you broadcast your life to the publics, people will surely talk, no matter what you do . Thank you ma, for these guide lines. We really need to stop getting all worked up over what people post or say to us. I think anger is in one's temperament which can only be controlled by the Holy Spirit, if the Spirit of God is in a person it can only dictate the persons conduct. Reading these five steps will help someone who has completely made the resolution to attain peace in life. Nice post Ma'am. Giving others the benefit of doubt and spending less time on social media are the most important points to me, if people can spend more time in the real world they'd realise people aren't all they claim to be while some have more to them than they appear to be, if we'd only get to know them instead of judge them. Indeed ma this ways can stop one from being angry if practised, it will also help one in building a good relationship with people as well build ones spiritual life and attain great height.